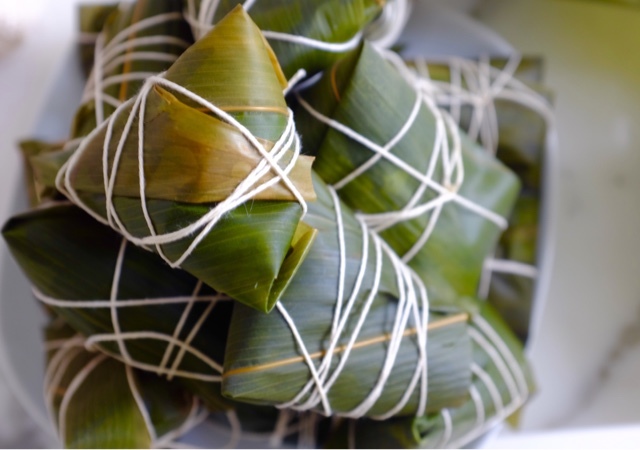 CAKE ON THE BRAIN: MINI STICKY RICE WRAPPED IN BANANA LEAVES "Joong/Zongzi"
MINI STICKY RICE WRAPPED IN BANANA LEAVES "Joong/Zongzi"
I have always loved joong (sticky rice wrapped in bamboo leaves) from New Town Bakery because the fillings most closely approximate the ones I grew up with made by my Poh Poh. Unfortunately, when she passed away when I was in my early 20s, I lost the source of all the recipes I loved eating growing up. I hadn't had the forethought to ask her for the recipes in my youth and that is my one big regret. Now, my kids love them all year 'round and sometimes they take joong to school for lunch in their thermoses. In the morning, I would take the joong out of the freezer, microwave one on high for 3 minutes and then plop it into a saucepan full of boiling water for 15 minutes to ensure it was heated all the way through. We have always lamented the fact that each joong was too big for each kid; yet one joong was not quite enough for both to share. I always supplement with extra Chinese sausage because the store-bought joong only had a miniscule little sliver of sausage that the kids fought over. The salt-pork, mung beans and salted duck yolk were parts of the joong I'd pick out because the kids didn't care for it. My mother is not a font of information when it comes to cooking Chinese food. She is more apt to buy cooked food from the market or go out to eat. She was a career woman so never had the time to stay at home with her mother to watch her cook or learn the secret recipes. So, that leaves me to search the internet for Toisan mothers and grandmas online who make what most closely resembles foods of my youth. 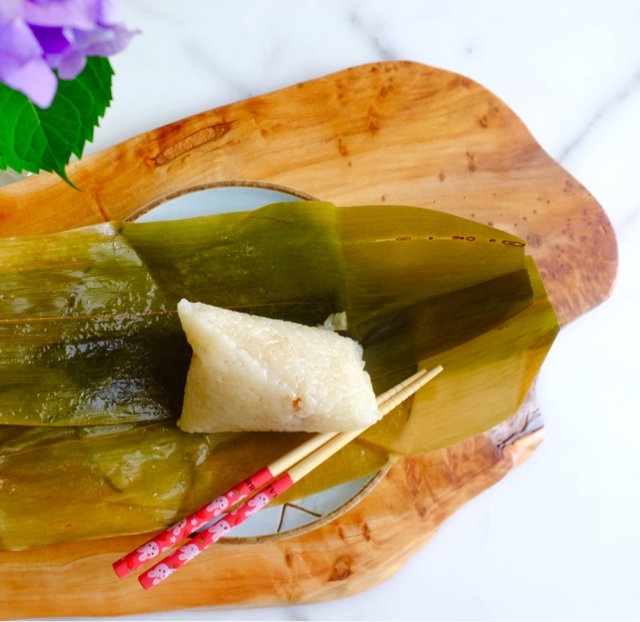 Fortunately for me, people have documented how to wrap these tricky-to-fold rice dumplings on youtube. I had no idea how to go about it having never made them with grandma in my youth. So today was pretty much a test to see if I could do it. I made a small batch in mini shapes so that I wouldn't be frustrated if I had problems. Let me know if you want a video of me doing it and I will make one; otherwise there are plenty on youtube if you look. I learned a few tricks from watching several. I think I was channeling PohPoh because these turned out fabulously! The sticky rice was perfectly seasoned, the fillings were so tasty and proportional to the rice. The problem with other peoples' joong--their fillings were chosen for their family's tastes. My kids hate seafood (dried scallops & shrimp), don't care for dried shitake mushrooms, would rather not eat salted duck egg yolk (though I'm starting to enjoy it as I age) and don't appreciate mung beans (which I love). The 9 yr old is allergic to peanuts and it seems that every auntie that gifts some joong to my mother makes theirs with tons of peanuts. It's like biting into a nut-bomb. I dislike the texture and flavour of peanuts myself and find them quite repulsive (sorry peanut-lovers). So these mini joong were specifically made for the kids and each one is smaller than my fist. Each contains: 3 slices of Chinese sausage and 1 piece of salted pork belly. That's it. So simple and so yummy. No weird stuff. 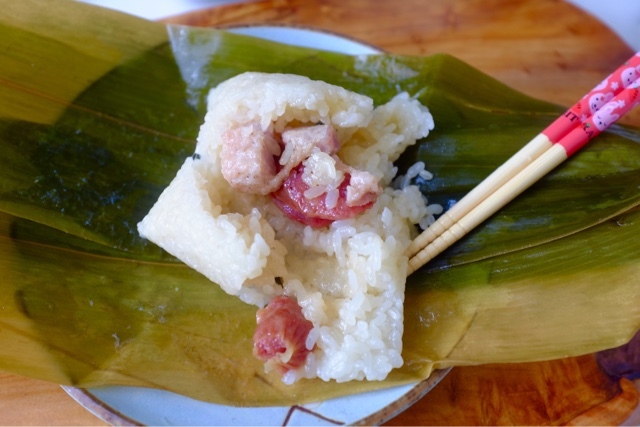 Just good ol' pork fat that renders out into the glutinous rice to infuse it with rich flavour. The fantastic thing about joong is that the fillings are customizable. You could even go vegan if you wanted to by filling it with red beans, peanuts, firm tofu. 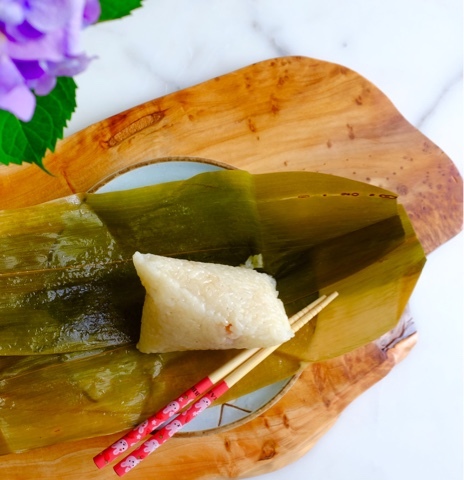 I'm going to try making the sweet joong which is served in my household with maple syrup! My Poh Poh always put a red stick in the centre which I assume is for good luck because it certainly didn't leave any flavour...just a stain of red dye that radiated from the centre. I might also try a sweet tapioca and red bean mini joong too. They look so cute and yummy. Soak the sweet rice overnight. The next day, drain completely in a colander. Mix the soaked, uncooked rice with light soy sauce [or tamari]. 2 tablespoons avocado oil and 2 teaspoons salt in a large bowl and set aside. Soak the mung beans overnight. Have ready the kitchen twine and sharp scissors for cutting the twine. Take 2 leaves: layer the leaves with the shiny side up; larger leaf on the bottom. If you are OCD, you can place stem ends in opposite directions and trim off the tips to even out the ends. Fold lengthwise close to the centre. Then fold up about a third from the end facing you. Create a cone by opening up the leaves leaving the folds to the right. Fill with a little rice on the bottom, along with your egg yolk, pork belly and pieces of Chinese sausage. I used 3 small pieces of sausage for each mini joong. 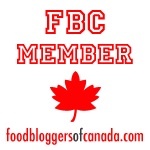 Use 1 tbsp mung beans if using. 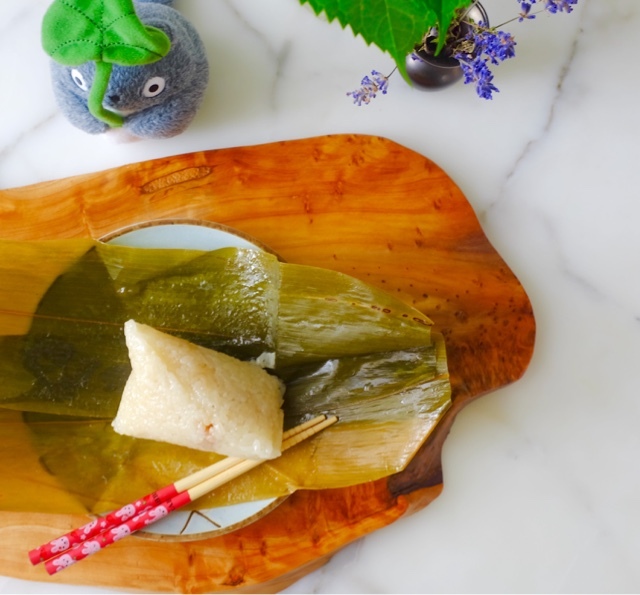 Fold the top of the leaf towards you so that it covers the rice. Ensure that you bend crisply at the fold making clean corners pointing out. Then fold down the edges of the fold to create a point using the trapezoid shape to guide you...all the time cupping your hands at the bottom of the cone so it doesn’t fall apart. Watch the youtube video. It's easier seen than explained. Tie the joong securely with twine. Cut off excess bits of the leaves with kitchen shears. Continue until your leaves and filling are used up. Place joong in a large stock pot. You might need a plate to weigh them down. Fill the pot with cold water, until the zongzi are submerged. Place the pot on the stove over high heat. Once the water boils, turn the heat to low/medium-low, and let it simmer for 1-2 hours. Check the pot occasionally to make sure the joong are always submerged in water. Only add boiling water to adjust the water level—do not add room temperature or cold water. Remove and cut open the joong leaves to serve, discarding the twine and bamboo leaves. After cooling to room temperature, you may place in freezer bags, where they will last for months. When you want a quick meal, you can defrost by putting each in the microwave for 2-3 minutes or you can boil them for about 20 minutes to reheat. Serve piping hot with hot sauce (I prefer XO sauce) and soy sauce. The kids only use sweet soy sauce instead of regular soy sauce on theirs.